Agility is one of the newest performance events, requiring the dog to run an obstacle course accompanied by its handler, all the while competing against the clock. The obstacle course is a scaled-down version of the course police or military dogs train on. 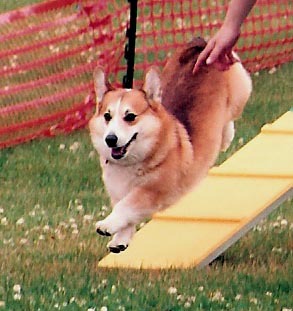 Pembroke Welsh Corgis, along with Cardigan Welsh Corgis, dominate agility in their size class, and are as enthusiastic and competitive as Border Collies. Pems frequently love agility much more than obedience and can be found enthusiastically roaring through an agility course barking happily the whole way, or "yelling" at their owners to hurry up! USDAA, NADAC, NCDA and AKC organizations provide agility competitions for corgis to compete in. The Pembroke has a pleasant temperament. His intelligence and eagerness to please makes for a personable dog who is interested in learning, but sometimes not interested in repetitive training. The independence of his working dog lineage coupled with his innate intelligence means that he can get bored with an invariant training routine and therefore needs a variety of exercises to keep his interest in a task. Newer techniques using positive motivational methods and food training are ideal for the average Pembroke and have produced some very good obedience dogs. Their eagerness to please their owners, coupled with a tendency to be little "hams" in public, is an underlying reason why they do so well in obedience. Tracking is a sport where the dog must pick up and follow one person's scent to the end of the trail and locate an article (a glove). Advanced tracking complicates the situation by having different people lay cross trails; the dog must stay on the original one to the end. Most Pems take very readily to tracking, some obtaining their first tracking title within months of beginning training. Being low to the ground does help the nose work. Variable Surface Tracking tests are designed to mimic tracking in an urban environment, over asphalt, concrete, grass, etc. The Pembroke is the smallest of the Herding group of dogs. As with many other members of this group, the working instinct has not been taken advantage of for quite some time, especially in the United States. However, it is still in evidence in several lines today, and Pembrokes have competed and earned top honors (High in Trial) in competition at AKC herding trials, competing with other herding breeds. Pembrokes have been primarily associated with cattle and were originally used to drive the cattle to market (drovers) but they can showcase their talents with sheep, ducks or geese. evaluate their type and soundness. Many dogs who have completed their conformation championships can also be found successfully competing in obedience, tracking and herding and when not at a show are usually pampered pets. The Pembroke, due to his intelligence and eagerness to please, is a standout in many other areas of canine work. Pems are often used as Hearing Ear dogs, assisting owners afflicted with hearing impairments. They alert their owners to important sounds, similar to the way Seeing Eye dogs help their owners. Other Pembrokes have become Therapy Dogs, friends for older adults in nursing homes or hospitalized patients.